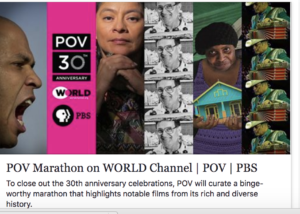 Talcual Films | Ella Highlighted on POV Anniversary Marathon! Ella Es El Matador (She Is The Matador) selected for the POV Marathon along with many other wonderful documentaries to celebrate its 30 years anniversary. If you are in the US you can watch it on Jan. 1st here all the info – please share!! Buenísimas noticias, Ella Es El Matador seleccionada para el Marathon que celebra POV el 31 y 1 de enero. Si vives en EEUU la puedes ver el 1 de Enero junto a otros grandes documentales!